This 76" collapsible decoy tree with heavy duty metal construction. Simple setup and includes a storage bag for easy transportation in and out of the field. 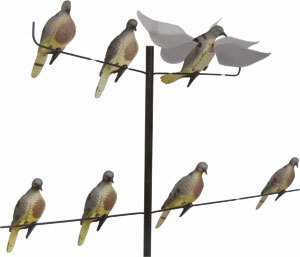 Most spinning and flapping wing game bird motion decoys can be mounted to the tree. Limbs move slightly with the wind. Great for pigeon and crow hunting too! 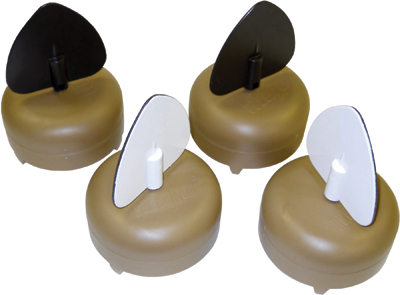 The Triple Play dove decoy is our best dove product to date. The carousel like base motor presses into the ground and rotate 3 dove decoys around twisting and turning just like feeding doves on the ground. 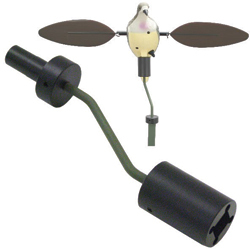 The motor's abrupt start/stop sequence creates realistic feeding motion from the 3 dove decoys mounted at the end of long wire carousel arms. This product boasts 100+ hours of battery life on 4-AA batteries(not included). The decoy breaks down for transport and comes with a carry bag for the disassembled components. The center of the motor base will accept one of our Dove-n-Air dove decoys for added realism (sold separately). You’ve seen them work for Duck Hunting now watch them work for Dove hunting. With their ease of transport, ease of set-up, lightweight construction and drop dead effectiveness, these low cost spinners will prove to be your best investment. 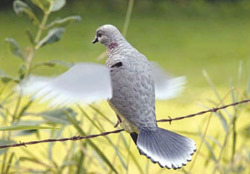 The Rapid Flyer Dove is a motorized flapping wing dove decoy. 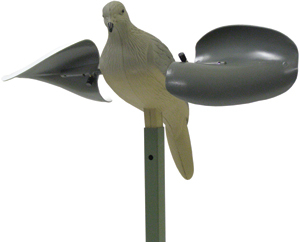 (Also known as the Dove-N-Air) This decoy has an intermittent timer in the flapping wings which makes them start and stop for added realism. Built in clip for attaching to fences or trees. Includes a fabric carry case and steel ground stake that can be adjusted from 7' to 12". Removable wings for storage and transporting to the field. Requires 3 AAA batteries(not included). The success of the MOJO spinning wing concept in the 90s became a phenomenon in duck hunting. Found to work just as well on doves, this led to the development of the MOJO Dove, which became the most popular dove product on the market. It functions as a long range attractor and finisher pulling doves in that would otherwise never see your set up. To provide a much more realistic view, the Flock A Flickers were developed for ducks, using the Spinning Wing concept but with several small wings with varying intermittent flashes scattered throughout the decoys. The Dove A Flickers bring that same game attracting ability to dove hunting in a smaller package specifically designed to set on the ground in the dove field. Scatter on ground in front of your stand for greatly increased attraction. With the Dove A Flickers, no need to “get the right spot” in the dove field, instead make your spot the X! 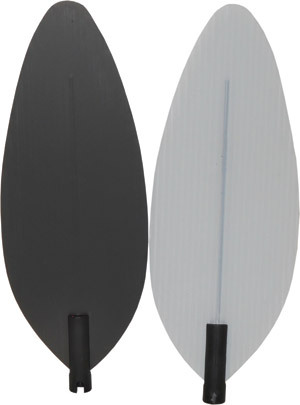 Replacement magnetic wings for your MOJO Doves or Pigeon decoys. The all new MOJO Live Action Kit is the ultimate accessory to make your MOJO dove decoy come alive. Dual pivoting action is obtained through a ball-bearing mechanism that allows your decoy to rotate as well as move around the pole! DOVE DECOY IS NOT INCLUDED.